Drill chuck is an indispensible tool during processes of industrial manufacturing with a comprehensive range of applications to be utilized on all kinds of machine tools, hand tools, electric tools, air tools, and medical instruments...etc. 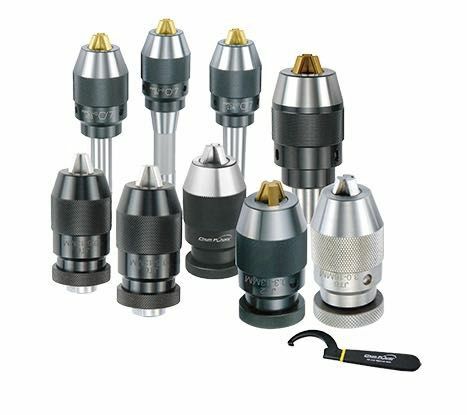 In view of the importance of chuck tool, CHUMPOWER has spared no efforts in R&D and developing applications of precision chucks for more than 3 decades. The company has plentiful experiences in manufacturing technologies and innovative developing capabilities. The EX-POWER series is the one-and-only being able to rotate bi-directionally to seize the blade. It is suitable for all kinds of tool holder. The integral design can reinforce the ruggedness and precision of power drilling chucks and can fit the processing of heavy cutting. Even the spindle of machine halts all of a sudden, the blade won't fall off accordingly. As far as development and advance of chuck forms year-after-year is concerned, CHUMPOWER had introduced plenty of precision automation equipment such as DMG MORI, Hartford, and GIFU...etc to ensure processing quality. Not to mention the utilization of internationally renowned inspection facilities such as ZEISS, HAIMER, and Mitutoyo...etc. to significantly improve the processing efficiency and yield of production. Products of stable capacity and quality can be supplied. CHUMPOWER has dedicated itself in developing tools feature easy-to-operate and high functionality to be used together with existing tools to make the best use of each tool. Different demands from user can be satisfied. In pursuit of high quality together with impeccable administrative system, CHUMPOWER has become the largest manufacturer of chucks. In order to cooperate with government and promote the trend of Industry 4.0, CHUMPOWER shall continue the investments in S/W and H/W equipment. Not only coordinating with big data analysis of cloud applications, the productive management inside the plants shall continue to be adjusted and optimized so as to provide drill chucks of better quality, higher precision, higher chucking power, high rigidity, and high rotation speed to satisfy customer demands.